Sermon delivered on 8 May, 1965, at the Bayswater Synagogue, London (where Rabbi Apple served as the minister from 1960-1965). You will forgive me on this occasion for being personal in much of what I say. This is a day of very mixed feelings for me. Five years I have spent here – not a long time by any means, in an old congregation dating back a century and more. I came as a young man, and I leave scarcely less young. Certainly, most of what I know of the practical work of the Ministry I learnt here, and for that I shall always be grateful to Bayswater, and my wife and I have felt privileged to grow into your midst, to join in your joys and share your sorrows, and to develop with many of you friendships based on mutual regard – friendships which we hope to maintain and strengthen. I have stood here conscious that it is a pulpit made great by distinguished predecesors from Adler and Gollancz onwards. Even so I believe I too have made my humble contribution to Bayswater and am not ashamed of it. I was brought up in a synagogue where demanding standards were expected of the minister, and I have tried to place those standards before me at all times. I believe that if the minister is to be successful as a spiritual leader he must never be a mere functionary bribed to leave the congregation’s consciences unruffled and undisturbed. He must create work for himself and maintain the self-confidence, tenacity, sense of humour and patience to pursue what he believes in and never make the mistake of being deflected by those who belittle, carp and denigrate, who take the petty view. He must try to take no notice of those who speak contemptuously of him and deliberately misinterpret his work – and I cannot pretend that there are none such in Bayswater. Some people are satisfied to have a synagogue to pray in – once or twice a year; to gossip about – continually; and to bury them – eventually. That is a short-sighted and bankrupt concept of the synagogue. The historic concept is that of a Bet Am, a “house of the people”, which brings together people of all kinds, of different backgrounds, of diverse interests, all united by their common Jewishness, to have Jewish experiences and be inspired intellectually and emotionally to carry the values and teachings of Judaism into daily life. That is the concept of the synagogue that I believe in. 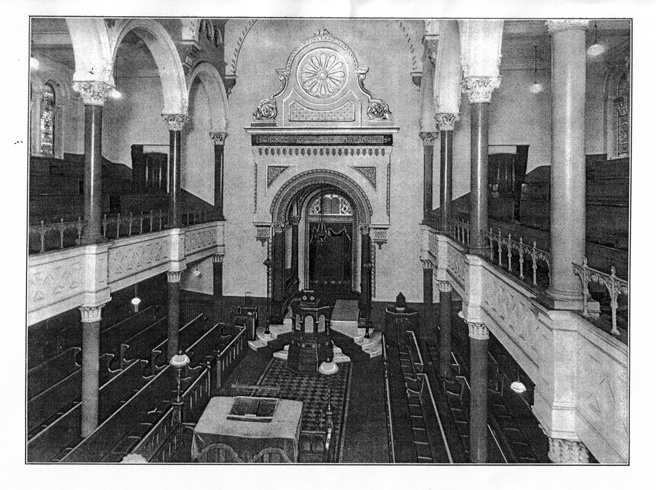 And that is the type of synagogue that I have tried to mould in Bayswater. All those pleasant and arduous activities of the past few years may have seemed spontaneous but were deliberately planned towards that end. The daily shiur in the midst of the fellowship of the morning minyan, the Oneg Shabbat on summer Sabbath afternoons, the Tuesday evening meetings in private houses, the synagogue magazine, the GCE Class, the Breakfast Club, the social and cultural evenings, the festival parties for children, the interfaith activities, the communal seder, the Monday evening Hebrew classes for adults – all made this old building ring with life and joy, and I want to thank all those who worked with me in organising this. I love the historic spirit of Bayswater but I had to try to make this a place of living faith, not a mere sleepy museum of Jewish antiquities. I am not convinced the attempt has fully succeeded. The highlight and central occasion of recent years was undoubtedly the centenary celebration of 1963. I will not conceal my disappointment that the occasion made little difference and did not inspire that renewal and rededication which we so ardently hoped for. The faithful few remained faithful and enthusiastic; but amongst the many there spread still further a horrible, corrosive apathy. And then unfounded rumours began to spread that we were closing down. Rumours can be cruel and no doubt they too exacted a toll on the morale of the congregation. Geography has been against Bayswater, also, not only in recent years, but for generations. This building is not well sited for present day needs and this has often contributed to a mood of depression. But with all its drawbacks, there is not another synagogue anywhere which can rival it for atmosphere once you step inside and pause to meditate and pray. More, this building is now one of the last physical links with the London Jewish scene of a century ago. But soon it will be no more. The bulldozers are creeping closer and closer. * Chichester Place, with its mellow charm and historic memories will have vanished… I hope a special service will be held in farewell to this building, and that those formerly associated with the congregation, ministers, chazanim, and members, as well as the wider community, will be given the opportunity of taking part. One question is in all our minds. Will the transplanting bring new life? Will the traditions of Bayswater blossom forth again? The answer depends on whether we understand tradition correctly. Superficially, synagogue tradition means the mode of service that has long been carried on in a particular synagogue. This kind of tradition has its value, and it can and must be respected in the new Bayswater, for it enables worshippers to feel at home in the service and discourages impudent tempering with sacred things to tailor them to every passing whim of an ignorant individual. But if this is all that tradition means, it may cease to be a virtue and may become a convenient cloak for staleness, obstinacy, impatience of new ideas, and worst of all, it may be clung to stubbornly whilst it is becoming daily more and more irrelevant to the real business of religious faith and spiritual needs. Somewhere there has to be a more lively idea of what faith really requires and how it may be interpreted and presented in the age we live in. This is the kind of tradition, the deeper kind, which is much more inspiring and relevant – the commitment to an ideal and belief that that ideal can bring meaning and challenge into personal and national life. Our sidra expresses it perfectly: the will to holiness. In all that we do in the synagogue and beyond we should ask ourselves, does this conduce to holiness? “You shall be holy people unto Me,” says God, “for I, the Lord, am holy.” How are we to imitate God and achieve holiness? “For I have separated you from the peoples, to be Mine,” goes on our text – holiness is the ability to separate, to know how to discriminate between false gods and true gods, false values and true values, false ideals and true ideals. Surely an ability which is vitally necessary today. This is a mass age; man follows unthinkingly the habits and values of the crowd, and his distinctions are blurred. There is no longer a clear line between right and wrong. “Between holy and profane.” We too need to know what is holy and what is not yet holy. We need to cultivate a sense of reverence and respect – for thoughts, for people, for ideas, for values, even for places and activities which have the power to inspire. Everything is dragged down to the level of the gutter today – marriage and the family are old-fashioned concepts, just as much as honesty and integrity; even human life has become so cynically cheap that the exploitation and mass destruction of it is not greatly deplored. “Between light and darkness.” What will bring light to the world, and what will darken it? There too we must learn to discriminate. We must know where to draw the line between justice and injustice, between peace and co-existence, between tolerance and contempt, between human relations and racial discrimination, between what is ethical and what is not, between what will bring honour to him that does it and that which will bring him only shame. “Between Israel and the nations.” We are Jews, and we are not the same as the other peoples of the world. There is a difference between us, a difference based on history and on deep conviction. It helps no-one to slink away and try to erase his Jewishness or to eradicate all that is distinctive in Jewish tradition and teaching. And particularly when rapprochement between Jew and Christian is in the air, let us learn once and for all that mutual understanding is only possible between those who have a strong and intelligent grounding in their own faith and are not eternal adolescents, who still don’t know where they belong. “Between the Sabbath day and the six working days.” The Sabbath day stands for all those time-hallowed values of prayer, study and observance in love of the mitzvot of the Torah. But these we so often tend to neglect and spurn and we turn the six working days into seven days barren of every smallest spiritual influence. Without the Sabbath there is no Judaism, without Torah there is no Judaism, without God there is no Judaism. Without Judaism, we Jews live as twilight people, never knowing or tasting the joy of spiritual illumination, without ever being aware of the daylight that God and Torah can shed on the life and the problems of man. “For the commandment is a lamp, and the Torah is a light.” True religion sheds light and guides the perplexed out of the twilight of uncertainty and indecision towards confidence and holiness. 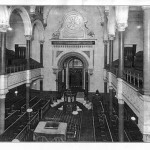 * In 1965, the Bayswater Synagogue in Chichester Place, Harrow Road, London W2, was acquired by the Greater London Council and demolished to make way for a motorway.